What are journalists worth in an age where anyone can tell their own story online? Has their diminishing value led to the growing violence against journalists across the world? 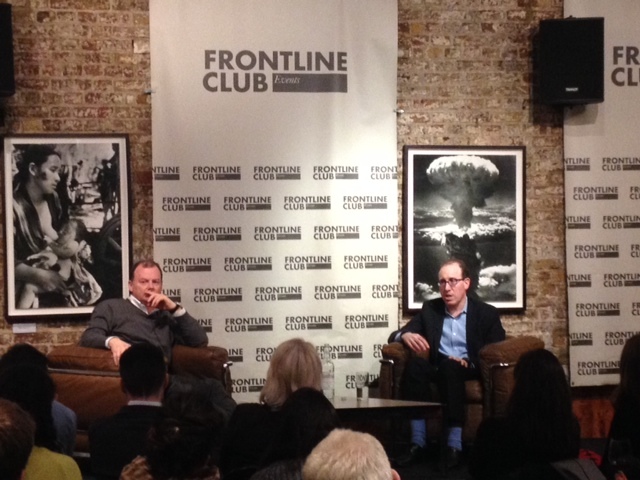 This is the argument that executive director of the Committee to Protect Journalists (CPJ), Joel Simon, put forward at the Frontline Club on Tuesday 17 March. Following the release of his latest book, A New Censorship: Inside the Global Battle for Media Freedom, Simon joined an engaged audience to discuss the reasons behind this ongoing diminishing of press freedom on a global scale. The discussion spanned from the current global spike in the murder, kidnapping and intimidation of journalists, to the futility of media blackouts, to the ways in which the internet has permanently changed the face of the news industry. Speaking to Richard Sambrook, Director of Journalism at Cardiff University and chairman of the International News Safety Institute (INSI), Simon pointed to a paradox: access to overwhelming amounts of information blinding people to the urgency of the crisis in press freedom. “We’re so deluged by information that I think we fail to see the ways in which censorship and repression are actually creating gaps in the essential knowledge that we need,” said Simon. Using case studies of Vladimir Putin’s Russia, Hugo Chavez’s Venezuela and Recep Tayyip Erdoğan’s Turkey, Simon‘s book demonstrates how repressive governments use systems of state control to undermine the work of the press. In situations such as that in IS-controlled areas of Syria and Iraq, journalists are now seen as targets, rather than tools to spread messages, commented Simon. Changes in technology that have allowed anyone to share their own message online have also robbed journalists of their monopoly on disseminating information, he said. Simon noted a clear correlation between increased numbers of people active online and greater threats posed to press freedom. In the past, kidnapped journalists were able to argue their usefulness to captors by arguing that they were an invaluable tool for communicating their stories. “If a journalist said that to IS they’d be laughed out of the room,” said Simon. The discussion then moved to the frequent media blackouts that are actioned when journalists are kidnapped, under the pretence of allowing direct negotiations to take place. Simon, however, argued that these blackouts only allow captors, such as ISIS, to assume full control of the narrative. The wide-ranging discussion also looked at the problem of Western governments prioritising national security over freedom of expression in the wake of recent terror attacks on journalists at the satirical weekly Charlie Hebdo in Paris. “I think the freedom of expression coalition lasted a couple of days and it’s been replaced by a national security coalition,” said Simon, and pointed to increased powers of state surveillance introduced in the UK within days of the attack. To tackle the current crisis of press freedom, Simon proposed a broad alliance between journalists and all groups with an interest in ensuring the free flow of information. “We need to form a grand coalition between all the forces which have a stake in ensuring that information flows freely,” he said. Only with the help of the global business and technology communities, NGOs and like-minded governments could journalists make headway in preserving the fundamental right to free speech, he said. More information on The New Censorship: Inside the Global Battle for Freedom of Expression is available here.